We’d love your help. Let us know what’s wrong with this preview of Thrice Upon a Marigold by Jean Ferris. To ask other readers questions about Thrice Upon a Marigold, please sign up. Is it a funny book? In some ways this is the silliest of the three. It's also the most dramatic & adventurous. I love Phoebe, the librarian, and Sebastian, the smith, even though they're a little implausibly wonderful. Well, as the subtitle says, this is a caper. I'm glad I read it, but I think my favorite remains the first. I will continue to look for more by the author. "When you don't know or can't know the answer to a question, why not believe the answer that you like best?" Way better than the second one and what a great addition to the character list. How can you not fall in love with a librarian who loves words and random facts. And when she meets a blacksmith who uses the perfect word for every situation and her love for those words ahhhhhhhhh how I sighed in love with the two of them. Honestly just melted thinking about them again. Our beloved king and queen have just had a baby! They love her so much the partially ignore their digs and their kingdom. Just when Way better than the second one and what a great addition to the character list. How can you not fall in love with a librarian who loves words and random facts. And when she meets a blacksmith who uses the perfect word for every situation and her love for those words ahhhhhhhhh how I sighed in love with the two of them. Honestly just melted thinking about them again. Our beloved king and queen have just had a baby! They love her so much the partially ignore their digs and their kingdom. Just when they are starting to realize this and try to get back on track their princess poppy is stolen by two exiled baddies. A little clichéd a little over the top but who cares?! It's a fun fantasy fairy tale story that is sadly lacking in my favorite troll but makes up for it with interesting vocabulary and a story that boys and girls can read. Thrice Upon a Marigold, by Jean Ferris was a hilarious, keep you entertained type of book. This book was fun, but not nearly as wonderful as the first two books. I thoroughly enjoyed getting to know Phoebe and Sebastian. They were so sweet and fun and hilarious. But their story wasn't nearly as wonderful as Marigold and Christian - who, by the way, are way less fun in this book. Overall, it's a decent story. But somehow, this book felt like it had been written for a younger crowd and was being spoon-fed to the reader a lot more. I didn't love that, but I adored the first book enough t This book was fun, but not nearly as wonderful as the first two books. This was a cute final installment. I liked it better than the second book, but it still doesn't quite have the same magic as the first. I like the new characters introduced in this story, and it's a really quick read. Again, this series is perfect for middle grade readers! fathers and wrangle with a dragon. A funny fairy tale that also has a romance. This was not as hilarious as I remember the first two being but it was still entertaining. It has been a number of years since I read the first two so my impression of this one could be skewed. I enjoyed all three books in this series of mixed-up fairy tales. I’m glad we discovered this light-hearted humorous set of books. Just a cute fun read. Always so nice to read the story of Queen Marigold and King Christian with their new baby Princess Poppy! Can we take a moment and just think about how cute that name is?? Anyway, highly recommend it if you have read the previous two books! Cover Love: Not really, but it is whimsical like the book! I adored Once Upon a Marigold and Twice Upon a Marigold, the first two books in this series. I was so excited to hear there was a third one. Romance? : Yes! Not only do we get to revisit Christian and Marigold, but another romance is brewing between Phoebe and Sebastian, two new characters. If you haven't read the first and second in this series please do! The kingdom that Chris 3 chocolate whoopie pies. If you haven't read the first and second in this series please do! The kingdom that Christian and Marigold is fun. They are such cute books, so much fun to read. This one really completes the series and brings it all to a close. Christian and Marigold are secondary characters in this book. They are both so enamored of their new baby, Princess Poppy, that it kind of takes the umph out of them. The enjoyable parts of Christian and Marigold aren't on display here, but with them moving aside we get to know two other characters--Phoebe and Sebastian. I adored Phoebe and Sebastian. They are the offspring of Boris and Vlad, former enemies of the kingdom. They are very invested in solving the mystery of Poppy's kidnapping to help people view them as more than the children of the two worst criminals in the kingdoms history. Of course as they work together to help rescue Poppy they get closer and closer to each other. The thing I really enjoy about these books is that even when there is danger it's not scary danger. It's still light and fun. This is a perfect middle grade book--excellent for kids not ready for anything more intense. This kind of book was written for the likes of the kid that I was, kids who delight in ‘Phantom Tollbooth’ and ‘Dealing With Dragons.’ It’s for kids not quite ready for Percy Jackson, or who simply prefer a more fairytale setting—fractured fairytale, but with characters they can care about. I loved that Phoebe was a librarian, and loved even more that what attracted her to Sebastian was his vocabulary. I did think that the book was a bit didactic, ala Victorian novels, but with tongue firmly in cheek—and the advice is all good, and won’t hurt kids to hear. I thought the book was well-structured, the world well-built and described, and the humor subtle enough not to be overpowering. I’m not sure how many kids will enjoy the format, and it does feel a bit young, but those who love it will really, really love it and seek out the rest of the series. Christian and Marigold have a beautiful baby girl, Poppy. Everyone is celebrating except the children of those that have been banished and are in hiding, Phoebe and Sebastian. Unfortunately, those banished fathers kidnap Poppy in revenge. This leads to an odd assortment of people attempting to rescue Poppy. Half of the book focuses on the bad guys and half of the book focuses on the good. Phoebe and Sebastian team up to find the princess, clear their names/reputation (sins of the father shouldn't reflect on the children), and possibly find their happily ever after just like Christian and Marigold have. An interesting tale of two young outcasts, Sebastian and Phoebe who are called upon to help the king and queen rescue their baby from two evil doers. It has all the elements of a fairy tale, however, at times these elements seem put there just because. The really fun thing for me as a teacher about this book is the vocabulary. Sebastian uses words that Phoebe as a librarian finds interesting. They are written in a different font from the rest of the text so that students will notice them. These a An interesting tale of two young outcasts, Sebastian and Phoebe who are called upon to help the king and queen rescue their baby from two evil doers. It has all the elements of a fairy tale, however, at times these elements seem put there just because. The really fun thing for me as a teacher about this book is the vocabulary. Sebastian uses words that Phoebe as a librarian finds interesting. They are written in a different font from the rest of the text so that students will notice them. These are words that are not usually seem in elementary chapter books. Part of the reason that reading is so good for students is vocabulary development and this one takes that to a higher level without being heavy handed. Some of the fun words include; calamitous, punctilious, and reconnoiter. As a reading language arts person I am always happy to see a book that has a text that will engage students and support their learning in areas other than reading. The name of the kingdom is a mouth full; Zandelphia-Beaurivage, still not sure the correct pronunciation but the kids love it. There were parts of the plot that are confusing. One example is why the moms of the two main characters have stayed with the dragon even after their husbands had been banished and their children are alone. Let me just say that when I found out this book existed, I rejoiced. Since I was a hu-u-ge fan of Once Upon A Marigold and Twice Upon A Marigold, when I stumbled upon this in the library, I had to take it home with me. However, once I showed it to my sister (who, as I recall, was once a huge fan of these books, too.) she couldn't recall reading any of them. That is my main problem with the book. The interesting premise of this series started too long ago that most of Jean Ferris' past audience i Let me just say that when I found out this book existed, I rejoiced. However, once I showed it to my sister (who, as I recall, was once a huge fan of these books, too.) she couldn't recall reading any of them. That is my main problem with the book. The interesting premise of this series started too long ago that most of Jean Ferris' past audience is no longer in her target readers. Marigold and Christian are all grown up ruling their joint kingdoms. Having a highly successful career as rulers, they have finally settled down and had a baby. Throughout the novel, the baby doesn't get much characterization, but that is okay--- because it's a baby. Bad things happen and Marigold, Christian and a new entourage of people set out to set things right. Even though there were some good laughs, I can't say that this is a good continuation of the ONCE UPON A MARIGOLD. The two main characters were pale imitations of themselves and--- let's just say some of the side romances were even more adorable than Marigold and Christian. This was my first experience with Marigold and, while I certainly enjoyed this busy little adventure, I can't help but wonder if it's one of those books I would have liked more had I further background. But, as I read, it didn't seem I needed background. Ms. Ferris aptly stated who everyone was and I felt there just wasn't anything else I needed to know. It's one thing to be underwhelmed by a book if it's due to lack of knowledge. But somehow I felt this might not be as good as its predecessors. T This was my first experience with Marigold and, while I certainly enjoyed this busy little adventure, I can't help but wonder if it's one of those books I would have liked more had I further background. The newborn baby princess Poppy has been kidnapped by vengeful villains, and off goes a chase and adventure to retrieve her. It's a fun and fast-paced plot that should hold young readers' attentions. I found myself enjoying the characters more than the story itself, particularly Phoebe the random fact-generation librarian. These are the sort of fun people that make a book (and series) work. Marigold was someone I felt I should better know, but as it was she fell into the background. This is book three in this series and what a great book it was to read. Marigold is a Queen and married to King Christian who just had a baby named Princess Poppy. Everyone is happy and celebrating the new arrival, except for the banished kids, Phoebe and Sebastian, until she gets kidnapped by the royal ex-poisoner-in-chiefs and fathers of Phoebe and Sebastian. She urgently needs to be rescued. With so many different people, including Phoebe and Sebastian, looking for the Princess the story goes This is book three in this series and what a great book it was to read. Marigold is a Queen and married to King Christian who just had a baby named Princess Poppy. Everyone is happy and celebrating the new arrival, except for the banished kids, Phoebe and Sebastian, until she gets kidnapped by the royal ex-poisoner-in-chiefs and fathers of Phoebe and Sebastian. She urgently needs to be rescued. With so many different people, including Phoebe and Sebastian, looking for the Princess the story goes on some crazy paths, but in the end will they save their precious Princess? I have to admit that we hadn't read the first two installments of the series. But, THRICE UPON A MARIGOLD didn't require you to have read the first ones. It was cute and rather typical. I read this story to my five year old and she enjoyed it. 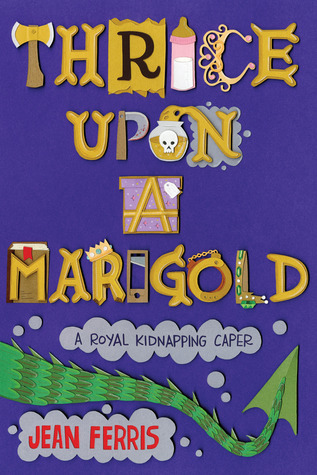 The baby princess is kidnapped, the villains are dastardly but is properly "taught" bad is not good, throughout the book. The characters are charming, the book is steeped with good moral fibers. It was a fairy tale of Happily Ever After proportions. Perfect I have to admit that we hadn't read the first two installments of the series. But, THRICE UPON A MARIGOLD didn't require you to have read the first ones. It was cute and rather typical. I read this story to my five year old and she enjoyed it. The baby princess is kidnapped, the villains are dastardly but is properly "taught" bad is not good, throughout the book. The characters are charming, the book is steeped with good moral fibers. It was a fairy tale of Happily Ever After proportions. Perfect for my five year old, rather tame for me reading it to her. I would think that readers at a 3rd grade to 5th grade reading level should really enjoy. I didn't notice to many hard words, or tough reading spots. It is well written and perfect for your young reader. I recommend it, but I also recommend not following my example and starting at ONCE UPON A MARIGOLD. To be published April 2013, thanks to Harcourt Children's Books for the ARC copy. I love me a good fairy tale, and this final book in the Marigold trilogy fits the bill. Marigold and Chris are funny, down-to-earth royals, who communicate better than most people I know. When their daughter Princess Poppy is kidnapped, they must both keep their wits about them as they rescue her. Dragons, elephants, true love, overcoming prejudice, evil villains and many other excitements are found here. Oh, and ho To be published April 2013, thanks to Harcourt Children's Books for the ARC copy. I love me a good fairy tale, and this final book in the Marigold trilogy fits the bill. Marigold and Chris are funny, down-to-earth royals, who communicate better than most people I know. When their daughter Princess Poppy is kidnapped, they must both keep their wits about them as they rescue her. Dragons, elephants, true love, overcoming prejudice, evil villains and many other excitements are found here. Oh, and how could I forget, a librarian who swoons over every (and I mean every!) well used word and a blacksmith obsessed with King Arthur. I am a fan of Jean Ferris. Her books are often both funny and poignant. But THRICE UPON A MARIGOLD didn't quite work for me; the magic has gone out of the series. Part of it is that Marigold, the former heroine, proved to be rather useless. But this one just wasn't as funny as the first two books in the series. It's a shame, because the heroine and hero are interesting people. The daughter and son of the kingdom's most notorious criminals, they've grown up to be law abiding. When they get wind of I am a fan of Jean Ferris. Her books are often both funny and poignant. But THRICE UPON A MARIGOLD didn't quite work for me; the magic has gone out of the series. Part of it is that Marigold, the former heroine, proved to be rather useless. But this one just wasn't as funny as the first two books in the series. When the most perfect baby is born in the kingdom you would expect everything to go smoothly. Not in this kingdom. Even though they now have a working tooth fairy program and an extensive p-mail system there are still those who like the old ways better and if they have to kidnap a princess to get their way, well they will. It is a cute adventure story. It considers the prejudice that characters who have bad parents deal with. It also shows that people can choose for themselves. Bottom line: Woul When the most perfect baby is born in the kingdom you would expect everything to go smoothly. Not in this kingdom. Even though they now have a working tooth fairy program and an extensive p-mail system there are still those who like the old ways better and if they have to kidnap a princess to get their way, well they will. Even though the story is predictable, it was a fun and funny read. This is the final installment of the series and King Christian and Queen Marigold are new parents. They are happy parents to Princess Poppy. With the evil Queen Olympia dead, there is nothing to worry about, right? When the baby Princess is kidnapped by two of the Queen’s men, “the Terrible Two”, characters from the first two books team up with a new cast to rescue the infant Princess. Recommendation: Recom Even though the story is predictable, it was a fun and funny read. This is the final installment of the series and King Christian and Queen Marigold are new parents. They are happy parents to Princess Poppy. With the evil Queen Olympia dead, there is nothing to worry about, right? When the baby Princess is kidnapped by two of the Queen’s men, “the Terrible Two”, characters from the first two books team up with a new cast to rescue the infant Princess.